Grand Complete (Grand Meadows) granules 25lbs(200 Day Supply)are formulated to offer a comprehensive series of nutritional components. Feed 2 ounces per day. 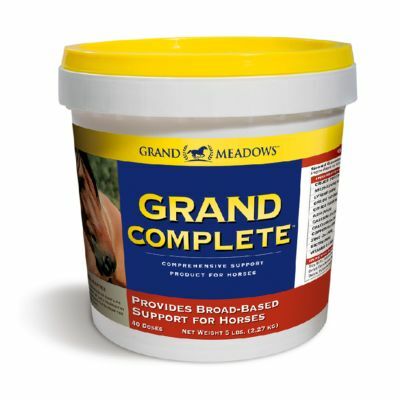 Grand Complete contains 1,250mg./oz(99 percent pure)Glucosamine HCL,along with 1,250mg./oz of MSM, as well as biotin And methionine for hoof maintenance, vitamins E And C for immune function, yucca, Omega 3 + Omega 6 to enhance the coat, live yeast + probiotics to enhance digestion. Blended with a palatable soybean meal base. Scoop is included.